Accessible from your mobile device or smart phone, the NIFMSE app is the show at your fingertips. You can look at the interactive show floor map, add exhibitors you want to visit to your “favorites”, see the schedule, and more. You’re also able to tweet directly from the app. Make sure you know what is going on and can participate in the show to your maximum benefit. Download the app to never miss a beat. It is everything you will need for the show and we highly recommend downloading it to stay organized and informed. For a more in-depth look at the app, take a walk through with our Interactive Media Coordinator here. You will want to have your business cards handy and make room for the business cards of those with whom you will be networking at the trade show. As you collect business cards, you have the option of keeping with the physical copy or going digital. If you select to take physical cards, place them in a holder, an organizer, or even a small bag. If you instead select to collect business cards digitally, here are 5 recommended apps for you to choose from. The benefits of collecting digital cards are instant organization and eliminating extra items in that you carry on your person. Stay hydrated! Not only is it important to stay hydrated every day no matter what, but when you’re moving and going, you need to have water with you at all times. Whether this by a pack of waters or a refillable bottle, keep something by your side. 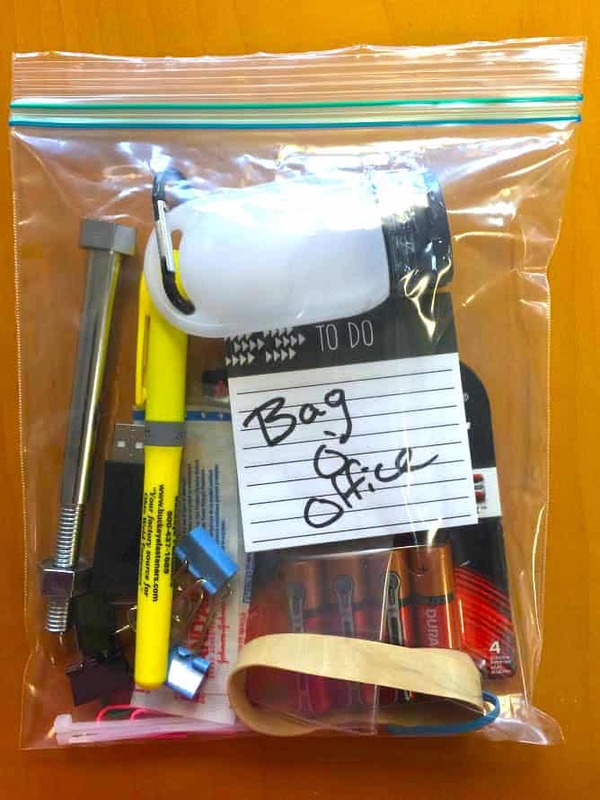 This nifty, office on-on-the-go has everything from rubber bands, to paper clips, to pins, sticky notes, bandaids, batteries, and more. You never know what you could need for organization, attachment, or other simple functions. Bring enough andshare with a new connection, maybe they forgot their very own bag-o-office. What is worse than having a pen that is low on ink? Not having one at all. From pencils to several pens, highlighters, and markers, bring something to write with throughout the show. Record details about the new networks you make, take notes at your most important seminars, create a to-do list (ex. get more pens). You might find a lot there, but come prepared. Can be any size, but we recommend a bag that rolls. You will be picking up a lot of giveaways and carrying around your items in addition to other items (noted above), so it could get heavy. Be prepared by having a bang handy. Outside of yourself, you want the people you meet to know about your company. Make sure you have informational material about who your company is, what they do, and how they are beneficial. If you do not have time to speak in depth with everyone you meet, instead of suggesting they check information out on their own, don’t rely on their memory and give it to them. Anything you want them to know, make sure you have physical information for distribution. You will be walking around or standing for long periods of time and over several days. If you bring a pair of shoes that might be uncomfortable, bring a second pair with you to change. Brings snacks that energize you and keep you ready to walk, talk, and listen. While junk food may be tempting – and at times satisfying – snacks that keep you alert and prevent fatigue will have your body thanking you later. Here are 11 items we suggest for starters. Between using your phone for the NIFMSE app, social media posts, photos, making phone calls, keeping track of time, and general use, you will run low on battery. You will not always have the option to run back to your room to grab your phone charger. Be prepared by carrying your charger with you at all times. This includes the cord and the outlet plug. If you have multiple people on a team, consider investing in an charging hub with the capability to charge multiple phones simultaneously. Some alternates to charging by cord and outlet is using the mobile charger, such as Mophie. What other items do you believe are essential to a trade show experience? Let us know. Register today with this EXCLUSIVE offer to receive 50% off show registration. Click below to get started. Great blog, Thanks for posting.